It was time to use up some very ripe bananas. 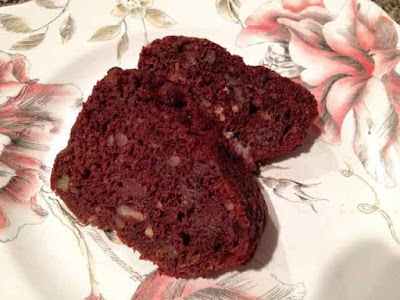 I tried a new recipe for Chocolate Banana Bread that I found on line. I converted the recipe into a gluten free version. 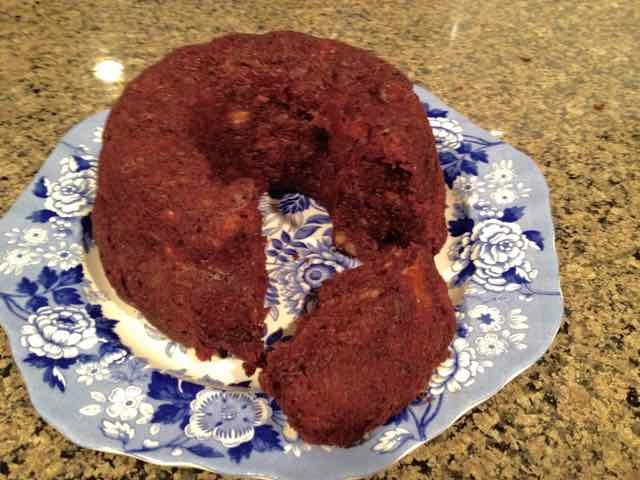 It is moist and chocolatey with a delicate banana flavor. This cake was too yummy and resistance was futile. It was rapidly gobbled up by appreciative friends and family. As I mentioned in my last post, it is very hot and humid here right now and I do not intend to turn on the oven, so I have been baking on top of the stove with great success. As with most quick breads, it was quick and easy to make. The original recipe uses a 9x5 bread pan. This pan will not fit in my stove top baking pot. 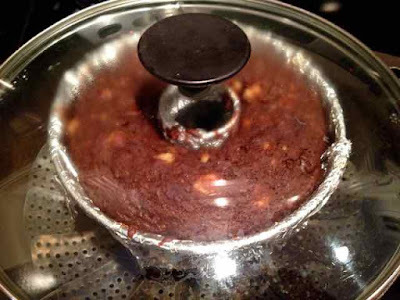 I had to use three small, cupcake sized cake pans as well as the 6” tube pan for this recipe. If you bake it in an oven just use one 9x5 bread pan. 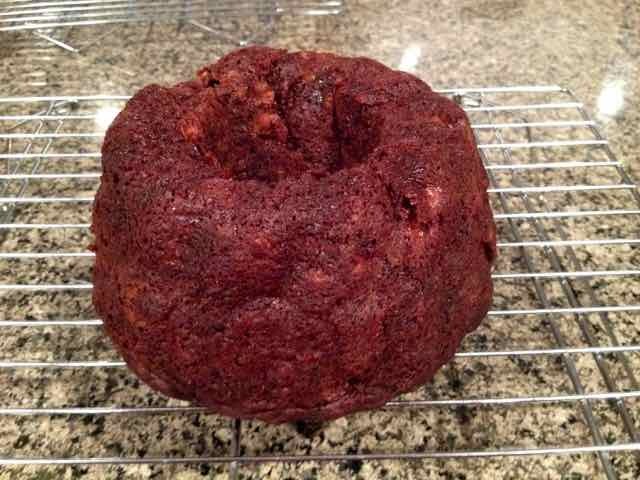 I made the recipe dairy free so that a friend could also eat it. I did not yet try an egg free or vegan version. I replaced the ½ cup butter with ¼ cup of applesauce and ¼ cup of oil. I find that replacing the butter or margarine in a recipe with oil makes most cakes moister and cutting down on some of the fat by replacing half of the oil with applesauce does not alter the outcome of the cake. I have replaced all of the oil with applesauce in my banana bread recipe with good results. 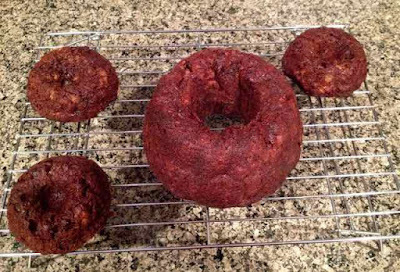 I think that this complete replacement of oil with applesauce might not work as successfully in other types of cake recipes. I chose to add chocolate chips, making it a double chocolate cake. If you drizzle the top with a chocolate glaze (totally unnecessary, but decadent in a good way) you could have a triple chocolate cake. Yum. Enjoy! 1) Prepare the pans by lining them with foil and greasing them well with butter, margarine or oil. Or line the loaf pan with parchment paper. 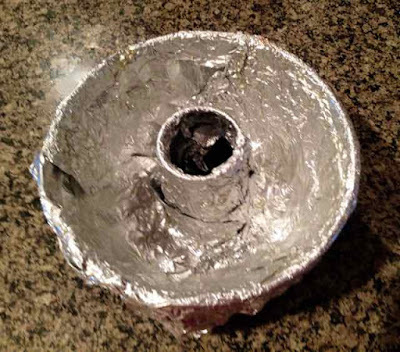 Tube Pan lined with foil and then oiled. 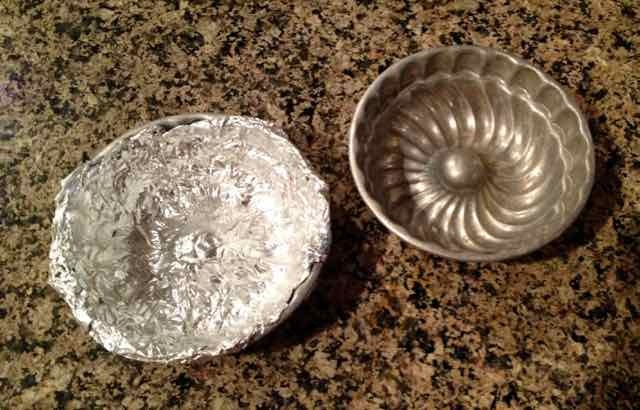 Small, cupcake sized pans for left over batter. 2) If baking in an oven, preheat the oven to 350℉. If baking on top of the stove, place a metal rack or steamer on the bottom of a large cast iron pot or dutch oven. Cover the pot and preheat it DRY at medium heat (#5 on my electric stove). 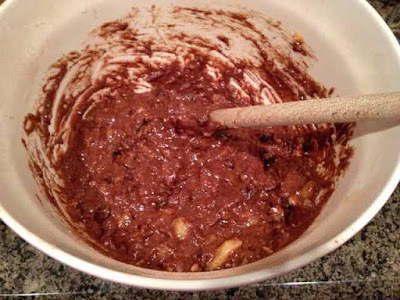 3) In a large bowl add all the dry ingredients and mix together well with a whisk. 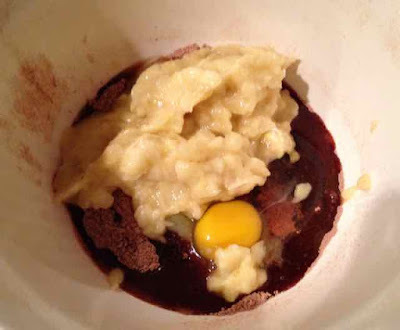 4) Add the wet ingredients to the dry ones and mix well with a large wooden spoon. Wet ingredients added to the dry ones. 5) If using, add the nuts and/or chips and stir in. 6) If using a 9x5 loaf pan, add all of the batter. 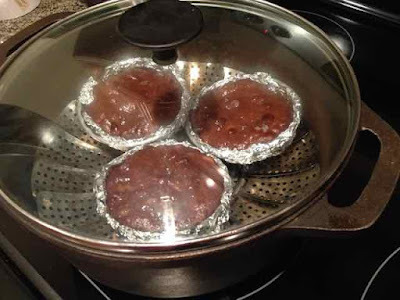 If using a 6” tube pan for stove top baking, fill the pan ¾ full and divide the rest of the batter into small, cupcake sized pans filling them ¾ full. 7) Place the pan into the stove top pot and cover it. After ten minutes turn down the heat to low (#2 on my electric stove) In my stovetop oven I cooked the tube pan cake for 1 hour total and the smaller ones for about 30 minutes. The tube pan and smaller cakes were ‘baked’ at separate batches (they would not all fit into the same pan at the same time). If using an oven bake the loaf or tube pan for 55-65 minutes. The cake starting to bake and rise in the stove top 'oven'. Small cakes baking in the stovetop 'oven'. GF Chocolate Banana Bread completely risen. 8) The cake is done when a cake tester comes out clean (except for melted chips and random banana chunks) or when the cake springs back when lightly pressed with a finger. Cake cooling on a rack. Large and small cakes cooling on a rack. 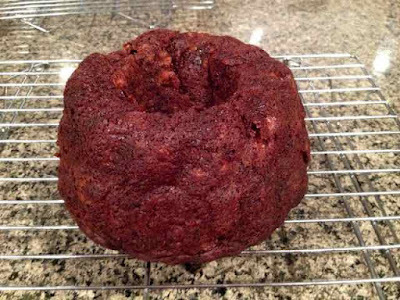 GLUTEN FREE CHOCOLATE BANANA BREAD Makes one 9x5 loaf or one 6” tube pan + 3 cup cake sized cakes INGREDIENTS Dry 1/2 cup Sorghum Flour ¼ cup Tapioca Flour 2 Tbs. Chickpea Flour 2 Tbs. Coconut Flour 1/2 tsp. Xanthan gum ¼ tsp. Sea Salt 1 tsp. Baking Soda 1/2 tsp. 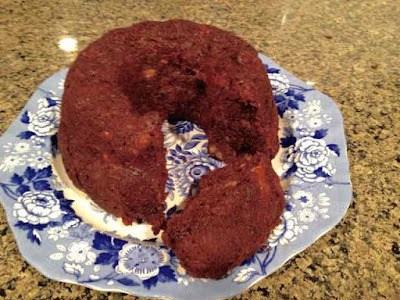 Cinnamon 1/2 cup Cocoa Powder (sifted to get rid of lumps) ¾ cup Brown Sugar (sifted to get rid of lumps) Wet 3 large Ripe Bananas - mashed ½ cup Unsalted Butter - melted OR For Dairy Free use a light tasting oil such as canola OR I used ¼ cup oil + ¼ cup applesauce (to cut down on the fat) 1 large Egg 1 tsp. Vanilla Extract Optional ½ cup Chocolate Chips (or use 1 cup of chips and omit nuts) ½ cup Chopped Nuts (Pecans or Walnuts) DIRECTIONS 1) Prepare the pans by lining them with foil and greasing them well with butter, margarine or oil. Or line the loaf pan with parchment paper. 2) If baking in an oven, preheat the oven to 350℉. If baking on top of the stove, place a metal rack or steamer on the bottom of a large cast iron pot or dutch oven. Cover the pot and preheat it DRY at medium heat (#5 on my electric stove). 3) In a large bowl add all the dry ingredients and mix together well with a whisk. 4) Add the wet ingredients to the dry ones and mix well with a large wooden spoon. 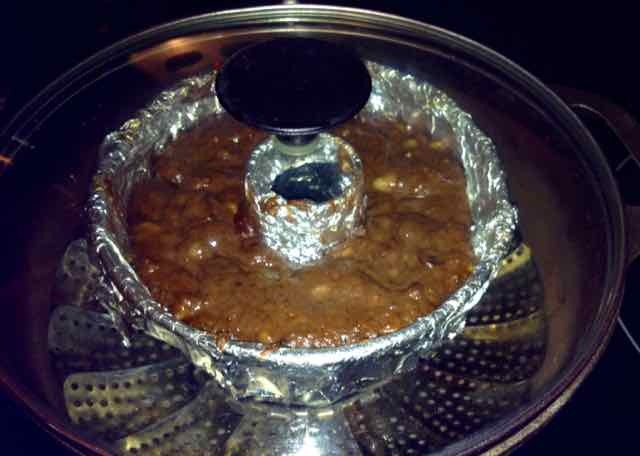 5) If using, add the nuts and/or chips and stir in. 6) If using a 9x5 loaf pan, add all of the batter. If using a 6” tube pan for stove top baking, fill the pan ¾ full and divide the rest of the batter into small, cupcake sized pans filling them ¾ full. 7) Place the pan into the stove top pot and cover it. After ten minutes turn down the heat to low (#2 on my electric stove) In my stovetop oven I cooked the tube pan cake for 1 hour total and the smaller ones for about 30 minutes. The tube pan and smaller cakes were ‘baked’ at separate batches (they would not all fit into the same pan at the same time). If using an oven bake the loaf or tube pan for 55-65 minutes. 8) The cake is done when a cake tester comes out clean (except for melted chips and random banana chunks) or when the cake springs back when lightly pressed with a finger.